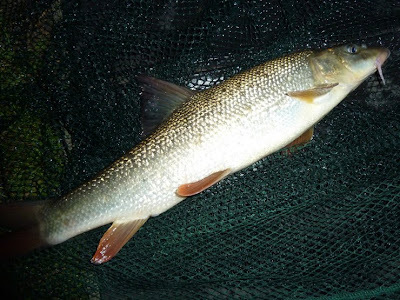 Caught this strangle looking fish last night, going to have to look it up in my Big Book Of British Fish to find out what it is... Oh yes, I remember now, it's a barbel - haven't seen one in a while! 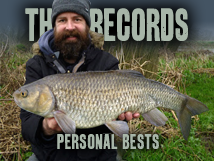 When Dan and I set the Barbel Challenge in the closed season we both knew we'd have a lot less time on the river this year - but we both thought the experience gained over the past season and a half would mean 300lb was a reasonable target (perhaps even a bit easy). Last year we fished likely looking spots until we found fish, then extracted a few before the shoal moved... Same plan this year except we are targeting bigger fish, but without the available hours it's hard to find the barbel. And we know it's tough fishing between October and February so to stay on target we really needed to be well into 200 pounds but the end of September. Something we're still hoping to do, no need to panic just yet! No far too small for a Barbel, it's a re-stocked Redmire Gudgeon!! Ahh, so THATS what a barbel looks like...I have heard of these mythical beasts.